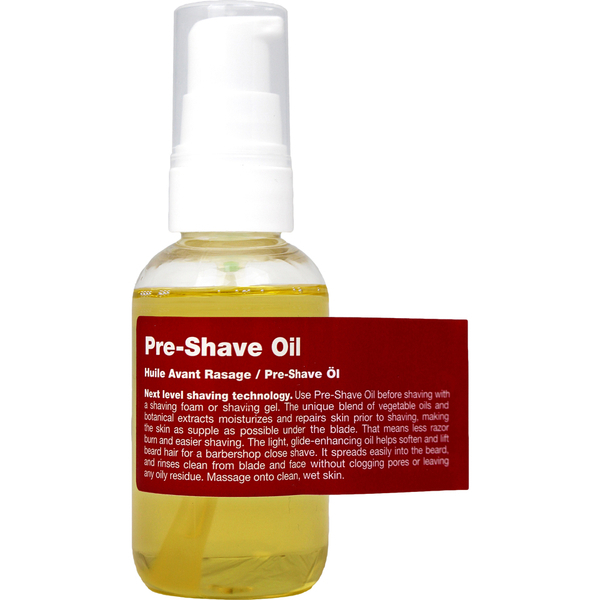 Safeguard from shaving cuts with the Recipe for Men Pre-Shave Oil. Enriched with a unique blend of botanical extracts and vegetable oils, the lightweight formula repairs and softens skin, allowing the razor to glide effortlessly across the face for a closer, smoother shave. Working to prevent razor burn and nicks, the moisturising oil delivers long-lasting hydration, increases suppleness and lifts hairs to ensure you achieve a comfortable shave every time. Doesn't clog pores or leave any greasy residue behind. E.N. Massage onto clean, wet skin. Use Pre-Shave Oil before shaving with a shaving foam or shaving gel.